As part of CMRL commitment to reach its apex of sustainable green initiatives has been awarded with IGBC highest Platinum Rating for balance 14 no’s of underground Metro Stations under Phase-1 successfully. The IGBC Chairman Chennai Chapter, Thiru C.N. 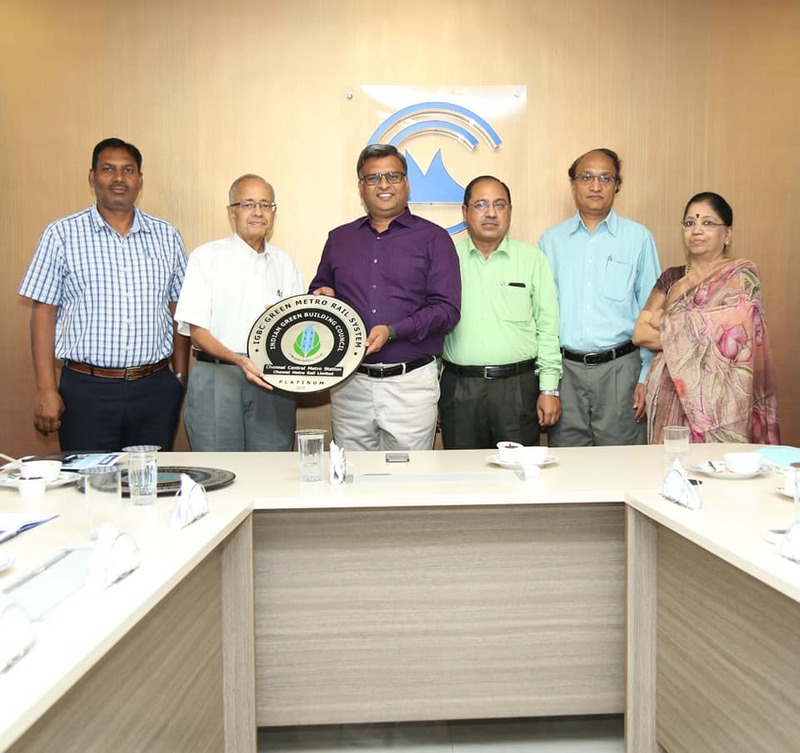 Raghavendran handed over the plaques and certificates for 14 Underground Metro Stations to Thiru Pankaj Kumar Bansal, I.A.S., Managing Director , Chennai Metro Rail Limited (11-03-2019). Director (Finance) Tmt. Sujatha Jayaraj, Director (Projects) Thiru Rajeev Narayan Dwivedi and Director I/C (Systems and Operations) Thiru L. Narasim Prasad along with Senior Officials of Chennai Metro Rail Limited, Project Director of the various Contractors of the project and the Green Building consultants have participated in the event. The stations that have been awarded IGBC highest Platinum Rating are Washermenpet, Mannadi, High Court, Central Metro, Government Estate, LIC, Thousand Lights, AG-DMS, Teynampet, Nandanam, Saidapet Metro, Pachaiyappa’s College Metro Station, Kilpauk Metro, Nehru Park. 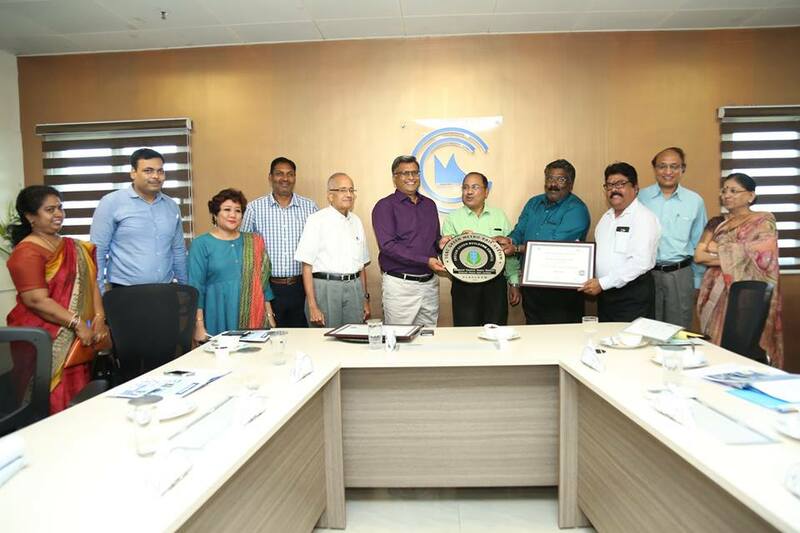 CMRL was awarded with IGBC highest platinum rating for 13 elevated stations and 5 underground metro stations (Thirumangalam, Anna Nagar East, Anna Nagar Tower, Shenoy Nagar and Egmore Metro) earlier. Totally 32 Metro Stations under Phase I have been awarded with IGBC Platinum Rating. 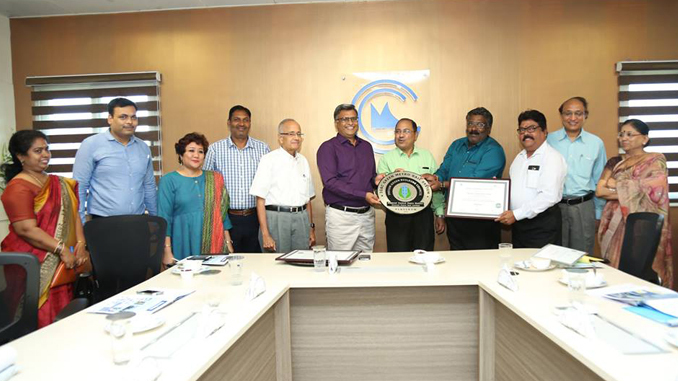 CMRL Administrative Depot is also LEED-NC 2009 “Gold” Certified Building since 18th May 2018. The stations are discerningly designed reflecting functional aesthetics, user friendliness and energy efficiency with station architecture that is environmentally friendly and green. 32.5% of regenerative energy shall be fed back to the grid and is expected to achieve an EIRR (Economic Internal Rate of Return) of more than 16.22%. During the construction stage, to take care of air quality, besides regular audit, barricading was done at construction site. In order to reduce inconvenience to road users, traffic plans were discussed with Chennai Traffic Police and the Independent Engineer and implemented at site. Noise pollution was kept at check by having constant site inspection by independent environment & safety expert. Care for Construction work force has been taken appropriately. Accordingly, Waste disposal plans have been provided at sites/labour colonies and portable hygienic toilets are provided for construction workforce. The workforce is also provided with basic facilities like personal protective equipment, first aid, emergency facility, lunch room, labour camps, drinking water facility and doctor on call. Universal access has been provided for wheelchair bound commuters, visually impaired commuters, hearing impaired commuters and staff assistance for our elderly, differently abled and needy people. The Project has moved with the intent that commuters are provided with a well-integrated system with all interstate bus terminal, railway stations and MRTS Station. In order to promote GoI vision of E-vehicles, CMRL plans to provide discounted parking to its users at the P&C area. Pedestrian facilities from the road to the concourse/ and/or to the ticket counters and back have been provided to enable unhindered smooth flow of pedestrians using the Metro and making the commuting experience comfortable. Rail Analysis Insights: The stations are discerningly designed reflecting functional aesthetics, user friendliness and energy efficiency with station architecture that is environmentally friendly and green.